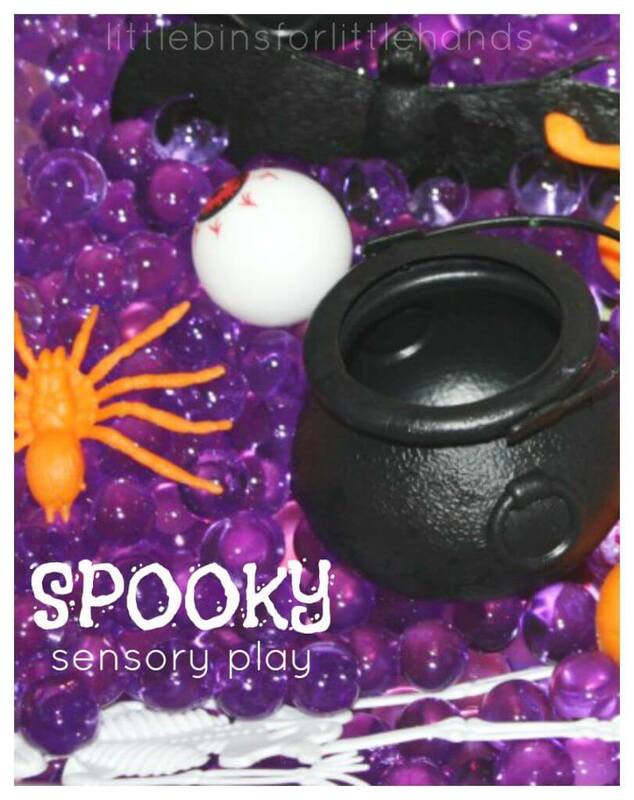 Halloween is a great time for making spooky sensory bins. Water beads make an awesome spooky Halloween sensory bin filler. 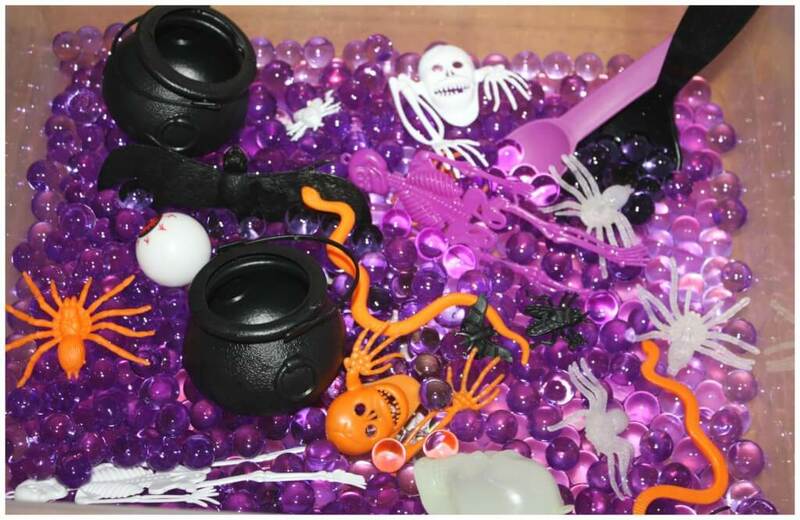 Create a quick water beads halloween sensory bin with a package of novelty halloween items and a pack of water beads. 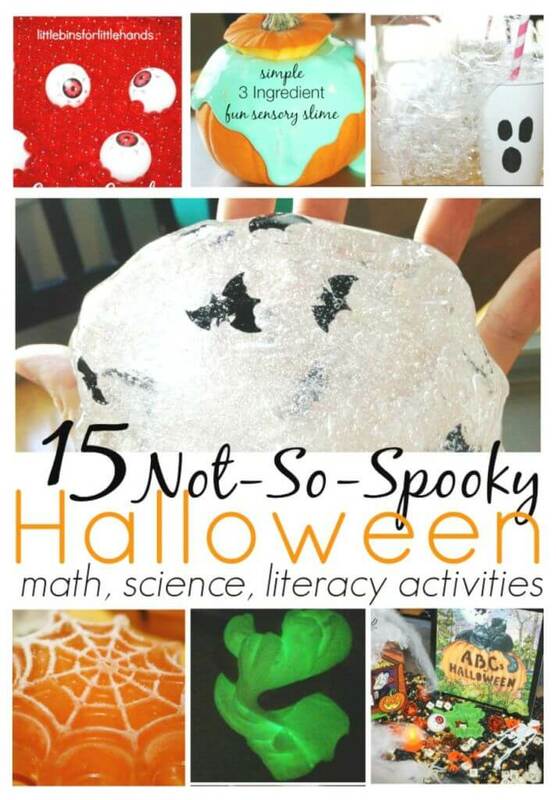 make sure to check out all our Not So Spooky Halloween Activities for quick play ideas all month long! Water Beads are a fun and unique sensory bin filler! They have such a cool and pleasing texture for most kids and adults! I love getting my hands into them. Plus, they don’t leave a residue, but they do feel wet and slippery. Easy to find, pick up these packets at a local craft store in the vase and flower aisles. They are in tiny packages under $2, and they look like tiny seeds or beads. Did you know water beads are even a quick science lesson in water absorption? To make your water beads, follow instructions on packet. Usually a quart and a half of water per package. Sit back and watch them grow. They do need a few hours to plump up fully, but it is fun to check on them with the kids! Soon you will have a bin filled with awesome, plump beads. Water Beads are simply enjoyable anytime of the year, but right now it’s Halloween. I grabbed a bag of dollar store themed decorations/toys and tossed them in with a couple little cauldrons and a couple of spoons! The possibilities for sensory play are endless with this unique sensory bin filler. If you are really patient and let them dehydrate on a cookie sheet, they can be reused. However, I just grab a new packet when we want to play with them again! Watch out they do bounce around quite a bit! They are also pretty cool frozen! Give them a try! I bet you will find a new, cool sensory play filler for your kids. We have tons of fun incorporating early learning concepts such as math and fine motor play into our sensory bins. 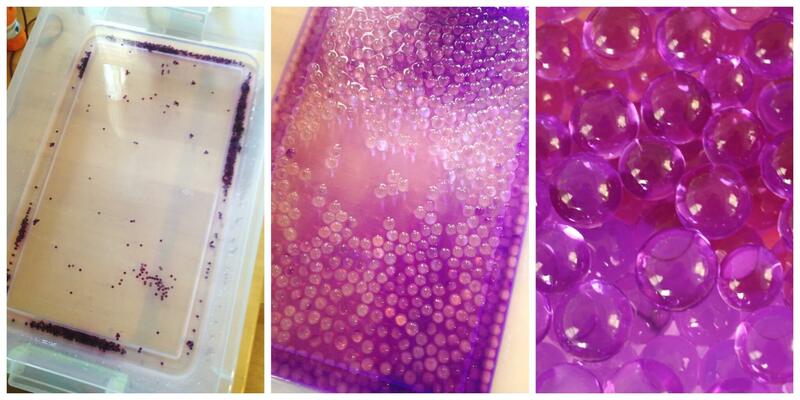 See some of our other water beads sensory bins below. All our Not So Spooky Halloween Activities! Disclosure: All of our favorite products featured here can be found on Amazon by clicking through the pictures! I receive a small compensation for sharing these products with you, but we own and use them all! I hope you enjoy all our activities we provide on this site for fun and learning!